The soap opera that is Uber; trends in digital marketing to watch and why the CMO is overwraught; what brand loyalty commands; enterprise social media strategy in 9 simple steps; Facebook's future may require sacrifice; Snap's roadshow continues; corporate innovation requires knowledgable champions and culture change; Waymo's IP lawsuit; AI and the coming decimation of blue collar jobs; podcasting as part of your content strategy; using white space to your advantage in content marketing; liberal arts is the key to the future; new habits; and more in this week's edition of The Full Monty. And don't forget to subscribe to The Full Monty podcast and check out where Brain+Trust is speaking this week. 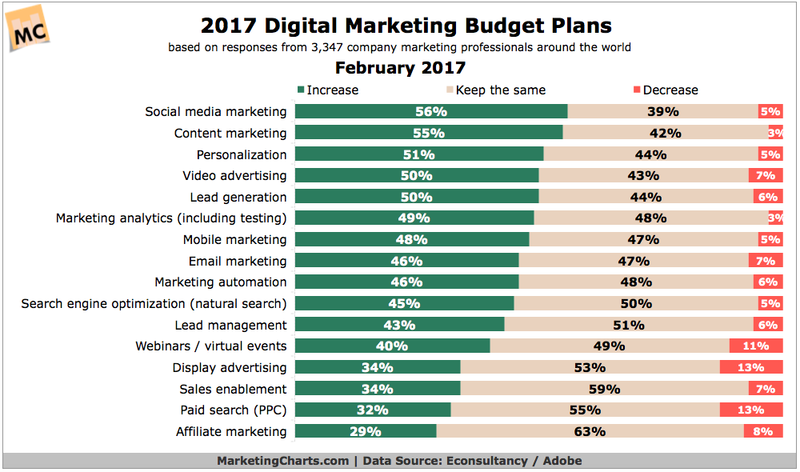 Some top trends for the digital marketing industry in 2017 include innovation, digital transformation, influencer marketing and more. Chris Salazar has the round-up. Digital is everything and everything is digital. It seems that the CMO's plate is becoming rather full. Speaking of which, here's a helpful list of everything CMOs must nail in 2017 via CMO.com. Packaged-goods marketers now spend more on digital than all forms of traditional advertising combined, according to a new study by Cadent Consulting Group. But effectiveness is still in doubt. Retailers posted Q4 earnings last week, and despite the mixed results, Walmart, Home Depot and Macy's all share the same observation: physical stores are still important, and online sales and digital strategies are key to bringing traffic and sales to stores. 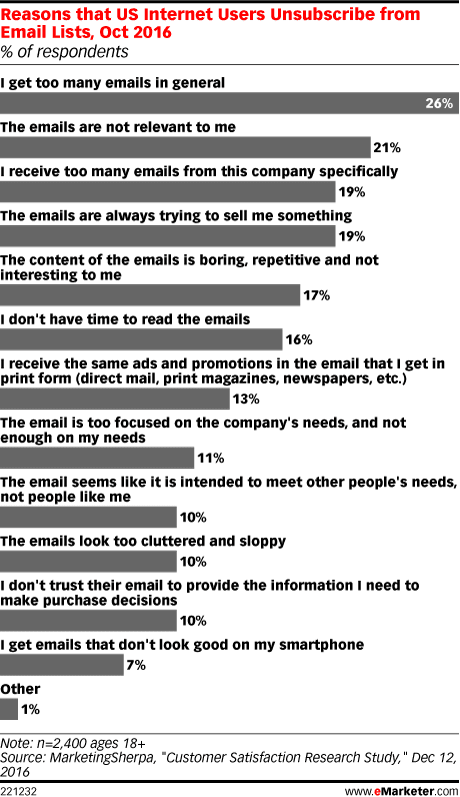 B2B marketers waste 19% of their budgets, according to a recent LinkedIn study. Awareness and closing are two important parts of the sale, but what does your content do to nurture your prospects? Millennial men have a unique set of viewing habits with more than half no longer paying for cable packages in light of new streaming services, while more than one in four respondents claiming they plan to upgrade their internet speed this year, according to research from Videology. In fact, 75% would rather give up cable than streaming. 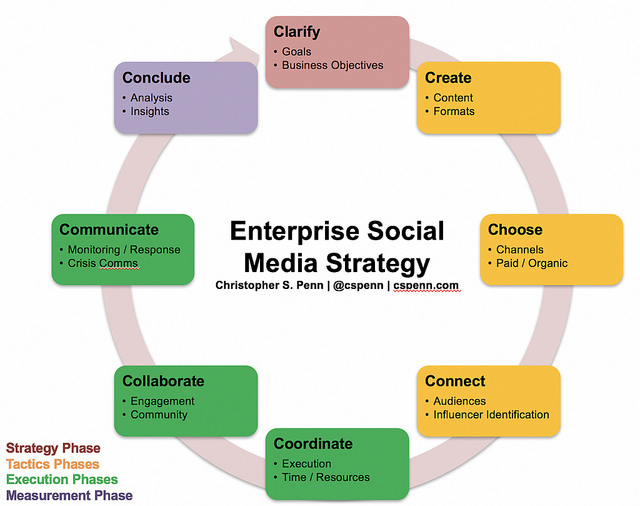 Christopher Penn's excellent 9-part series on enterprise social media strategy concluded last week. Well worth a read in its entirety. And congratulations to Chris on creating a capable collection of C's. Direct messages from brands on Twitter will indicate whether users are communicating with a bot or a human. Presumably so users can better understand when they're wasting their anger on an algorithm. Twitter opened up Periscope Producer to all users. The service allows broadcasters to incorporate high-quality live video from sources other than their mobile device. As we reported last week, Mark Zuckerberg shared his manifesto on changing the world. This week, Ben Thompson has a thoughtful piece on Manifestos and Monopolies, in which he calls for the prevention of any additional network acquisition for Facebook (such as Instagram or WhatsApp) and for Facebook to open its social graph to the market to answer broader socioeconomic and political issues. It's a tall order, but as Facebook continues its dominant march, it's something that must be considered. Facebook will begin testing ad breaks in partner videos, sharing 55% of ad revenue; Live videos from Pages with more than 2,000 followers will get this midroll ad option. Facebook continues its march toward television. Facebook is in talks with the MLB to live stream one baseball game per week. A tepid start, but Facebook is clearly trying to edge its way into Twitter's dominance of live sports. Instagram is giving users the ability to upload as many as 10 photos or videos at once in a carousel for followers to swipe through. Move over, Facebook. The Measurement Research Council has decided that in addition to reviewing Facebook's video metrics, it also needs to audit YouTube's third-party measurement partners. Another fascinating analysis from Stratechery that draws a comparison between Snap and Apple, via its company-as-humanity strategy, and its clear admission that cost of revenue will rise amid many product iterations, failures and tweaking things for their users. Whether or not Snap can follow the same success model as Apple is still in question. As the Snap roadshow continues, investors are particularly concerned about slowing user growth and engagement. Snaplytics (yes, we're serious) released a report about how brands are using Snapchat and gaining followers, looking at things like posting frequency, number of snaps per story, images vs. videos, story completion rate and more. A cautionary tale around a loose intellectual property strategy: Why I'm Leaving Snapchat details that more people are moving to Instagram Stories and enjoying its more authentic feel. Snapchat's inferior user experience, interruptive advertising, and lack of underlying network are among the culprits. Big companies are doing their best to often act like startups, but the most successful are using their unique advantages to foster a culture and ecosystem of new innovations. Who's leading corporate innovation? Every quest needs a hero, and in the world of corporate innovation, change agents leading the charge are experienced and highly educated. 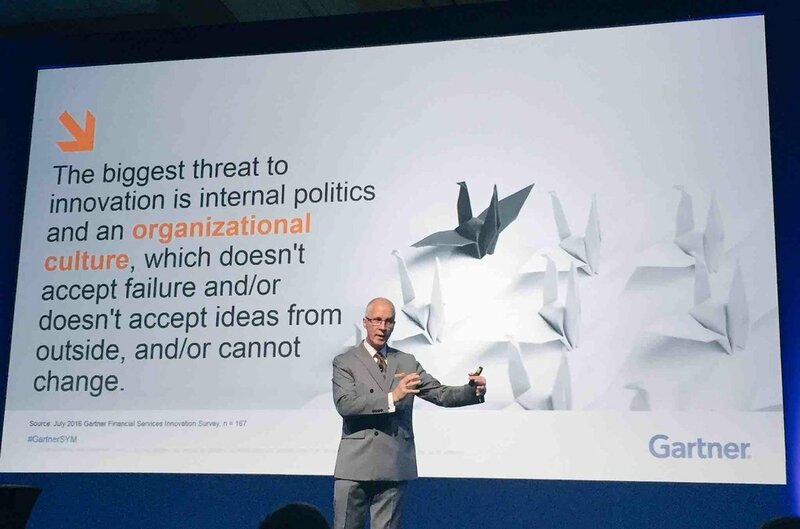 The greatest threat to innovation is internal politics and organizational culture that doesn't accept failure and/or doesn't accept ideas from outside, and/or cannot change. You may be using Waze to carpool soon. This will place Waze more directly in competition with Uber. But Waze's approach is to persuade regular drivers using its app to pick up people who are heading in the same direction. It's about behavior change. Will it succeed? Much depends on drivers' willingness to change their behavior, which is always tricky. And whether Uber's woes continue. Last week, we shared the blog post written by a female engineer in which she detailed a year at Uber, during which she experienced sexual harassment, an unresponsive human resources department, threats of retaliation (by HR, no less), and a dwindling percentage of female engineers. This week, early Uber investors Mitch and Freada Kapor wrote an open letter to the Uber board and investors after private appeals reached a “dead end,” saying that the current Uber investigation team is too conflicted. What's the Uber for soap operas? Turns out it's Uber. Uber's most glaring overall problems seems to center on how the limited human resources role was conceived by CEO Travis Kalanick. The issue: he felt the function of HR at Uber was largely to recruit talent and to efficiently let go of personnel when needed. You know, HR does executive development too. Just sayin'. Jalopnik is a bit more practical in its criticism of Uber: Forget the sexual harassment, the protests, the endless lawsuits, UberEats, China, the autonomous cars, and even the flying cars. Those disasters mask one critical issue: Uber is doomed because it can’t actually make money. The Uber fun doesn't end there: Alphabet's Waymo is suing Otto and parent company Uber for trade secret theft, unfair competition, and patent infringement, claiming Otto founder took LiDAR designs. Waymo even made a public statement about its lawsuit (a rare move for companies involved in litigation), saying that its former executive downloaded 14,000 confidential and proprietary designs, which the company then discovered when a supplier let them know they were contacted by Otto about making them. More questionable behavior by Uber: last year one of its autonomous vehicles ran a red light in San Francisco and Uber claimed "human error." According to two Uber employees, the vehicles were driving themselves and missed the red lights. If true, it goes to show the legnth Uber will go to try to win the autonomous vehicle war and what is at stake. Who will insure self-driving cars? The advent of autonomous vehicles may send the auto insurance industry over a cliff according to strategy+business. While consumers are warming up to the idea of chatbots, they're only getting what they want 30% of the time. Don't give up just yet; things are just heating up, writes Mitch Joel. Gini Dietrich interviews Christopher Penn about artificial intelligence, machine learning and its role in PR. Tax season may be less difficult and contain fewer humans (including accountants), as robots may soon do your taxes. More than the white collar jobs, AI and automation may soon implode the blue collar job market. More than China, Mexico, or other geopolitical forces, public policymakers need to address the impact of technology on jobs. McClatchy is debuting Video Lab West to experiment with production and distribution of VR, AR, 3D video and more, in collaboration with Google and YouTube. Jay Acunzo dissects three hidden lessons behind top podcasts to help yours stand out. Boiled down, they are: think format first, consider time constraints, and create recurring segments. But you should read Jay's full treatise to see how he brings these concepts to light. Pandora is debuting personalized digital audio ads and sequential messaging. The tool lets marketers build audio ads designed for listeners based on their gender, age and ZIP code, taking into account variables like the weather and time of day. Audio is one of the most intimate forms of media there is. Which is a perfect reason why podcasting should be part of your content strategy. Program of the Week: In honor of the Oscars and longtime host Johnny Carson, this week's podcast is The Carson Podcast, in which host Mark Malkoff talks with entertainers, show business executives, staffers and others who were associated with The Tonight Show starring Johnny Carson. Do you have a program to recommend? Add yours to our Google Sheet: smonty.co/yourpodcasts. In the digital age, consumers are always shopping around. New research from McKinsey shows that hooking them early is the strongest path to growth. The stories not being told can lead to opportunities to stand out; here’s how to take advantage of the white space and differentiate your content. In other words, zig while others zag. For as long as we've been at this, content marketing myths still abound. It's time to let go of mistaken beliefs like top tier content is easy to create, more content means more reach, finding great writers is easy and cheap, keep your best content on your own website, and longer = better. Similarly, here are five research insights to drive your content marketing. The White House held an emergency meeting about leaks. And that meeting promptly leaked. Press Secretary Sean Spicer explicitly warned staffers that using texting apps like Confide — an encrypted and screenshot-protected messaging app that automatically deletes texts after they are sent — and Signal, another encrypted messaging system, was a violation of the Presidential Records Act, according to multiple sources in the room. The lesson here: corporate secrets can also be leaked with such apps. Security officers should be aware of the risks they pose. Then again, leaks can occur via text too. Amazon is claiming that Alexa is protected by the First Amendment and therefore cannot be used as evidence in an upcoming murder trial. Now that's artificial intelligence indeed. You might want to think again about charging your device in a public USB port. It's a potential way to get your device infected. Didn't your mother teach you about touching things in public places? There's always devices like Umbrella USB, which acts like a condom for your USB charger. If you discover an analytics report with inflated data, what are you do do? First step: verify that it's skewed. Second step: determine the cause. Converseon has a white paper on embracing critical new end-to-end language technologies to help unlock the potential of data for effective social listening in 2017. From scaling human intelligence for language analysis to going beyond top-line sentiment to root-cause drivers, determining relevancy, the sunsetting of Boolean strings and more, there's much to dig into. Mark Cuban doesn't think that finance is the future. In fact, he recommends college students focus on liberal arts degrees, because our automated, data-driven future we'll require more free thinkers. There's a fine line between honesty and rudeness. What does it mean to be polite? Warren Buffet released his annual letter to Berkshire Hathaway shareholders. In it, he shared how to use fear to your advantage as an investor. Once formed, impressions are remarkably perseverant: so it may surprise you to learn why facts don't change our minds from The New Yorker. An important lesson to remember from brands that strive for reputation management or rebranding — you might do well to ignore the facts. There are valuable lessons from Sherlock Holmes on the art of writing. Even though his writing was limited to a few monographs (and questionably, two of the short stories), he demonstrated the importance of focus and making smart choices. It's natural to want to make changes to your life around the beginning of the year. If you made a New Year's resolution, are you still sticking to it nearly two months in? If you're like most people, the odds are that you're not. In this episode, we explore what motivates us to make resolutions at that time of the year, why it's the wrong time, and how we can begin to create habits that not only last the entire year, but a lifetime. The Full Monty, a Brain+Trust Partners publication, exposes you to the business intelligence that matters at the top of every week. 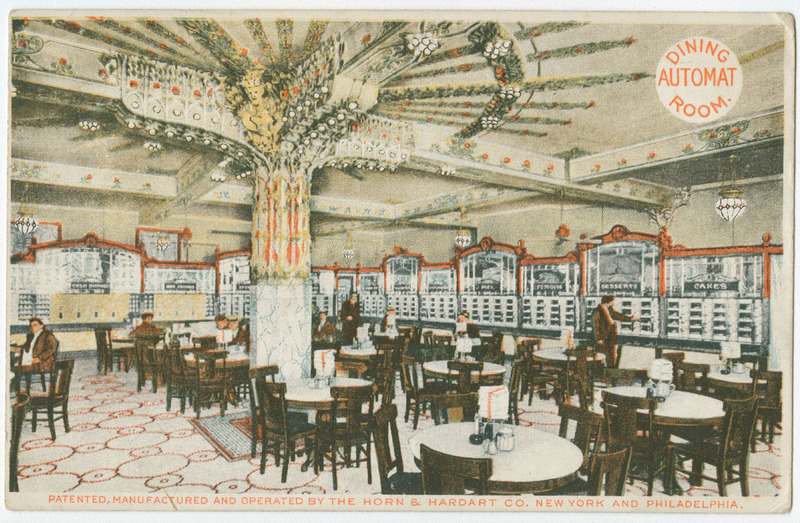 Please sign up for our email updates to make sure you don't miss a thing. And please share this with your colleagues if you find it valuable. Brand activism at the Super Bowl; getting out of your bubble - and remembering where you got your news; Twitter misses in Q4; Facebook Safety Check goes offline; the economic impact of ride-hailing apps; artificial intelligence may be detrimental to the middle class; VR gloves to match your trendy headset; testing your hearing with a film; experiences beat content; online anonymity is a myth; asking the right question before you write; and more in this week's edition of The Full Monty. And don't forget to check out The Full Monty podcast. The Super Bowl was a welcome distraction from political topics last weekend, as the fans watched the first overtime in the history of the contest. And as is the tradition, emotions ran high between plays as well as during them, with hotly anticipated commercials. This year however, a number of ads seemed to make subtle political statements. Did Super Bowl ads clear the way for brand activism? When brands do take a stand, they risk potentially alienating half of their customers. This year's Super Bowl ads led pollsters to question whether ads with a liberal spin pose too much risk. In the case of diversity, most audience members are receptive to the theme. In Audi's case, its' "Daughter" ad, under the theme of its #DriveProgress campaign, came under fire. The ad showed how girls are just as capable of boys. But Audi's board makeup and its payment practices don't match its words. These days, empty words and platitudes are not enough; you need to live the brand if you want people to believe you. Meanwhile, Budweiser's immigration-themed ad came under scrutiny from those supporting the president. But as they attempted to mount a slacktivist effort under the #BoycottBudwiser [sic], their attention to detail lacked a key element: they misspelled Budweiser in the hashtag. Not to mention the fans who said they'd flock to Busch beer, whose parent company was also founded by an immigrant. A Dominican newspaper mistakenly used a photo of Alec Baldwin as Donald Trump in a story about the president. 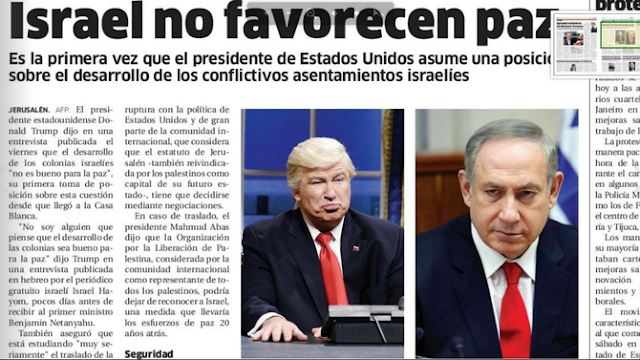 Yes, it's gotten to the point where other countries can't distinguish satire from reality within our government. Talk about fake news! According to the Pew Research Center, Americans can't remember where they read online news 44% of the time. Because there are a number of pathways most Americans follow to get news (usually through Facebook!) — news that is flowing an an unprecedented pace — it's difficult to get them to remember where they saw something. Something to keep in mind as a brand, too; you need to make their online experiences memorable and ensure that your shared content makes it clear where it originated. 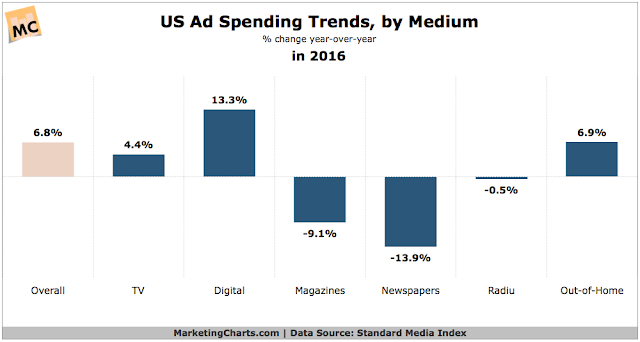 In a breakdown of advertising spending in 2016, we see a 6.8% growth overall, with predictable drops in newspaper and magazine advertising and a rise in television and digital. Interestingly, it was a slower growth than expected, given that a presidential election and the Olympics played a part. Flipboard released version 4.0, a slick new mobile interface that includes more custom personalized content. It's enriched with better artificial intelligence to both refine the articles you see and reduce the incidence of sites with annoying advertising or fake news. This involves both human and machine intervention. As CEO Mike McCue put it, "There's no real good algorithm for 'insightful. You need editors." There is more good information than at any point in humanity, but it's harder than ever to find and trust. The more we know, or can see, the less we trust. How Tech Ate the Media and Our Minds. Related: like a crack in the space-time continuum, there's a reason why we underestimate the time we spend on social networks. Not me. I'm on at least 25 hours a day. The case for digital reinvention holds a number of options. For example, while disruptive strategies are the most impactful, fast-following and great execution are the next best thing. Twitter reported its Q4 revenue for 2016: $717 million versus estimates of $740 million. However, the company beat earnings at $0.16 a share versus expected $0.12 a share. However, the real story was in the lagging growth of monthly active users: up only 2 million from Q3, for a total of 319 million MAUs. The quarterly revenue growth is the slowest since Twitter went public four years ago. Eyes are on the company's turnaround strategy and on part-time CEO Jack Dorsey, who needs to either step up or step down. Twitter is cracking down on abuse in a number of ways, including hiding inappropriate responses, turning on a "safe search" feature, making it harder for banned members to rejoin, and more. Late to the game, but at the same time, very much needed. Facebook is opening itself to a measurement audit by allowing the media industry’s independent measurement monitor, Media Rating Council (MRC), to audit the measurements it provides advertisers. The company will sell video ads based on the industry’s viewability standard, allow more granularity in performance measurement, and introduce an option for paying for ads only when users watch the video with the sound on. Facebook's Safety Check can now be used for organizing a community response offline. People can mark themselves as safe on Facebook and then visit the emergency's Community Help page to see what people need or offer things like housing, food or transportation. This is a responsible and potentially game-changing move for Facebook, moving it into the realm of utility and public service provider. WhatsApp added two-step verification. This security measure indicates how Facebook is moving toward parity among its holdings with regard to the safeguarding of identity and accounts. As Snap Inc. pursues its $25 billion initial public offering, Facebook is borrowing some of the moves that catapulted Snapchat to popularity with teens and young adults. At the rate of Facebook's "borrowing" of Snapchat features (ref: Instagram Stories), one might think that Snap's intellectual property disappears after 24 hours. We all know that Millennials and Gen Z love their Snapchat, but it might surprise you to learn that the fastest growing group on Snapchat is those over the age of 35. Likely because that's the only group that hasn't fully adopted it yet. Google introduced Cloud Search, a smart search engine for G Suite customers. Cloud Search is designed for use in larger companies where different groups and individuals have access to different files. Chalk one up for enterprise collaboration. Google may be removing millions of apps — including "zombie" or "junk" apps — from the Google Play store due to noncompliance with its User Data policy. Developers: now is a good time to check your apps to determine whether they comply. Lyft has hired the head of Google Street View to lead is mapping efforts. In addition to competing on price, service and timeliness, accurate mapping is where the ride-hailing companies will do battle. Google's Waze app began as simply a traffic tracking and reporting tool, but is morphing into a carpoool service and traffic congestion fighter. Waze says its new carpool service is now open to the nine counties that comprise the Bay Area, plus Sacramento and Monterey. One of the consequences of ride-hailing is plummeting prices of taxi medallions, which now sit at about half of their all-time high value. This in turn means a higher default rate on loans (now approaching 50%) and an undue burden on certain banks. In India, Uber is introducing UberHire, which allows customers to book a car for a certain period of time rather than just for a single ride at a time. An excerpt from Brad Stone’s new book, The Upstarts, which recounts the surprising rise – and possible fall – of the sharing economy: the inside story of the rise and rise of Uber. With Uber poaching experts from Carnegie Mellon University and showing no interest in the city's communities, Pittsburgh is discovering it's in a toxic relationship with Uber. It's been a one-way street in Uber's favor, city officials say. Ford Motor Company continues its push into autonomous vehicles. Ford is investing $1 billion into Argo AI over 5 years and will take a majority stake in the startup. Argo AI will work on autonomous driving technology for Ford's cars. Fatal car wrecks are down over the last decade; so is driving. Researchers are concerned that we're becoming too sedentary, due in part to the wide availibilty of online retail outlets and entertainment. Algorithms are aimed at optimizing everything. They can save lives, make things easier and conquer chaos. Still, experts worry they can also put too much control in the hands of corporations and governments, perpetuate bias, create filter bubbles, cut choices, creativity and serendipity, and could result in greater unemployment. The pros and cons of living in the age of code. As we continue to watch the rise of AI, we don't need to be worried about a Skynet-like demise; we need to be concerned about the demise of the middle class. Amazon is aiming to make Alexa's voice more expressive as it taps into speech synthesis. You can visit the Alexa Skills Kit website to see the complete list of Speechcons and hear what they sound like. Here are 5 examples of brands using Facebook Messenger bots to improve their marketing and customer service efforts. Before your go and build a machine-learning startup, please keep in mind what matters most is the specific business problems being solved, not the technology itself. 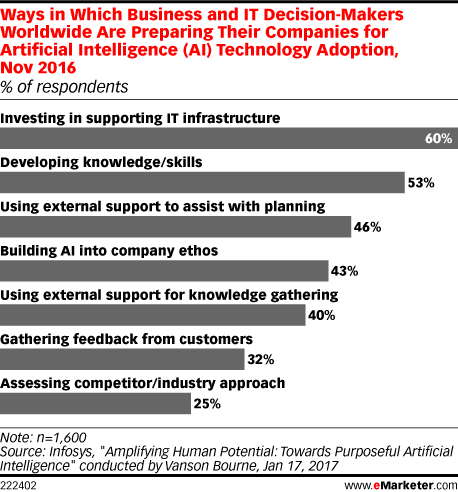 Companies are doing their best to prepare for the spread of artificial intelligence. Among their preparations are IT infrastructure, bolstering their knowledge and skills around AI, and bringing in third-party experts to help with planning. Oculus VR is working on gloves to enhance the virtual reality experience. From tapping out messages on a virtual keyboard to the all-important Spider-Man web throwing, VR gloves, together with the VR headset will make you look like a combination of Futurama's Bender and Arnold Palmer. Google released a new version of its Chrome browser with support for VR. The new capability means that users no longer need to download an app to view online VR. PodcastOne and Edison Research reported the results of their podcast advertising study, which showed the positive impact of podcast advertising on brand recall, intent to purchase and recall of specific messaging. The New York Times is offering free Spotify premium accounts to subscribers to sign on for a year with the news site. The promotion is aimed to boost the Times' readership, support Spotify's run toward an IPO, and provide an opportunity for the two to team up on digital advertising. SoundCloud lost its COO and finance director last week. The streaming music service, based in Berlin, had indicated that it was in danger of running out of money in 2017 and may need to raise more funds in the absence of sufficient revenue. Does Love Last Forever is a film with two different outcomes. Put on a pair of headphones and see which one you experience. This remarkable and innovative hearing test will give you a sense as to what those who are hearing-impaired experience. Program of the Week: This week's podcast is How Did This Get Made?, suggested by Tom Shea. Have you ever seen a movie so bad that it’s amazing? Paul Scheer, June Diane Raphael and Jason Mantzoukas watch suggested films and report back to you with the results. Do you have a program to recommend? Add yours to our Google Sheet: smonty.co/yourpodcasts. A new international survey of 4,000 consumers from retail predictive applications firm Blue Yonder reveals that shopping experiences—both online and in-store—are not meeting today’s customer expectation of purchasing goods anytime, anywhere. Content is just that — content. But when you can make something an experience, you've created a deeper and more memorable connection. The chief information security officer for the White House's Executive Office of the President has been removed from his position. The position is charged with keeping safe the staff closest to the president — including the president himself — from cyber-threats posed by hackers and nation-state attackers. Not really the wisest move at a time when the president still uses his own unsecured personal device. The Department of Homeland Security said that visitors to the United States may have to hand over their social media passwords if they want to enter the country. Data breaches announced last week included credit card information from guests at 12 properties owned by Intercontinental Hotels, and hundreds of Arby's restaurants that may put 350,000 of its customers' credit and debit card data at risk. Meanwhile, in Australia, the House of Representatives passed a bill for mandatory data breach notification. New research shows how web behavior can be traced to a person's real-world identity based on who they follow on Twitter. That's right: even if you don't tweet, your "anonymous" online behavior can be traced to your account. Always watching. Always. Don't get fall into the same metric traps that publishers frequently do: social engagement does not equal sentiment analysis; most popular content needs a time variable; shallow content may be popular, but it's still shallow. There's a shift in where companies are focusing their marketing technology efforts. Now its less on platforms and more about putting their efforts into understanding customer data, according to eMarketer. Louisville is using data in an intelligent way. The city is the first municipality on IFTT, where it is integrating with its Smart Louisville service and beginning with air quality monitoring. Your morning needs a 5-minute lifehack. With a five minute routine each morning, here's how some people add calm and take control of their lives. The Five Minute Journal. The key to writing a good mystery is asking the right question. It's not just for fiction writer; lessons abound for writers of all types. The first sentence from William Faulkner's "A Rose for Emily" silently poses the question: What was Miss Emily hiding in her broken-down old house? Tamsen Webster has launched a new show called The Red Thread in which she seeks to uncover the one thing that ties a life, an event, or a thing together—the through line. Her first example of a red thread in the wild is Mr. Rogers, who had to testify before a Senate committee to try to get funding for PBS.